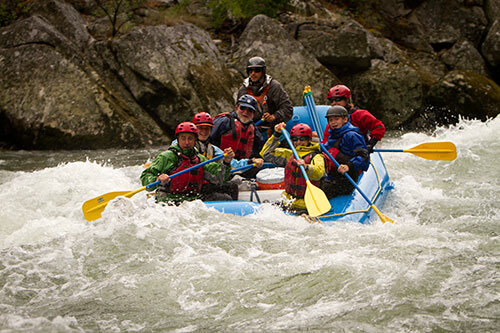 We feature adventures for family, friends and anglers on the world-famous Middle Fork of the Salmon, with special seasonal offerings on the Jarbidge/Bruneau and Owyhee rivers in southwestern Idaho and within Yellowstone National Park. Wilderness Luxury Customized To Your Desires! With Far and Away Adventures you won’t have to carry a thing or lift a finger as we create your riverside sanctuary each day. Connect with the wilderness in a safari setting while adventure guides set-up and breakdown five-star camps. An organic menu prepared with fresh ingredients along with select wine will be served atop linen-draped tables lit by candlelight. Far and Away also arranges state-of-art tents with elevated beds, flannel bedding, carpets, nightstands and lanterns. Come; let us show you an outstanding experience in one of the most beautiful places on Earth. We take all the ‘civilized comforts’ and place them in a beautiful and secluded location. Enjoy the pampered luxury of a fully attended camp with unbeatable views!